After 22 weeks of dieting, I keep thinking back to a much-discussed article we published more than five years ago in Fast Company. Called “Change or Die.” It was a bracing reminder of how hard it is for people to make deep-seated changes in their habits, even when they know the price of failure may be death. I know, I know. There’s nothing more boring than when bloggers write about their own experiences as a way to make a broader point about life, work, or society. But I hope you’ll indulge me this one time, as I reflect on a small matter of personal improvement and ask what it might say about the bigger challenge of making change in organizations. Now that Labor Day has come and gone, I can share the results of a project that has engaged me over the spring and summer–losing weight. I have lost 32 pounds over the last 22 weeks. This is a big deal for me, and not just because my new theme song is Bob Dylan’s “Ballad of a Thin Man.” It’s a big deal because I achieved something I’ve been thinking about for years–getting to the weight I was in college, more than 25 years after I graduated. 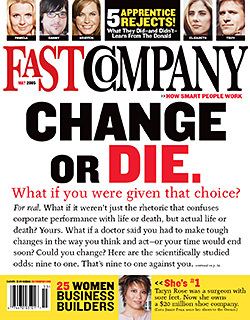 As I reflect on what I learned over these last 22 weeks, I keep thinking back to a much-discussed article we published more than five years ago in Fast Company. Called “Change or Die.” It was a bracing reminder of how hard it is for people to make deep-seated changes in their habits, even when they know the price of failure may be death, in the form of a heart attack. These are powerful questions –whether the issue is personal or organizational survival. And they are the questions I was dealing with. True, I have no health problems. I just wanted to shed some pounds. But it’s a goal I’ve been unable to achieve for more than 25 years, despite exercising hard virtually every day of that quarter century. So why did I succeed this time, when I’ve failed so often before? Here are three explanations for why I was able to downsize myself–and some thoughts about how they apply to the broader challenges of change. 1. Language matters, and the language of hope beats the language of fear. I never, ever told myself (or anyone else) that I was “on a diet.” I always told myself, and explained to others, that I was on a “nutrition program” to make me more fit. That was a distinction with a real difference. The language of “dieting” is the language of sacrifice, denial, and eventual futility. It’s all about the bad things you’re going to try to stop doing, what you’re giving up, and not about all the good things you’re going to start doing, what you’re building towards. The sense of “embracing a program” rather than “following a diet” focused my attention on positive progress, on what was to come, rather than on what I was doing wrong before. Language, it turns out, plays a huge role in all kinds of change programs. In “Change or Die,” Dr. Dean Ornish explains why he stopped trying to motivate people by “fear of death” and instead oriented them towards “joy of life.” Joy “is a more powerful motivator than fear,” he argued. What he didn’t say, of course, is that so much of how leaders make the case for change is based on fear–if we don’t cut costs, or increase margins, or eliminate cycle times, we’ll go out of business. So here’s a challenge to change leaders: How do you explain what you’re leading your colleagues to, as opposed to what you’re changing them from? How do you focus on the pleasures of progress rather than the fear of failure? 2. Simpler is better. I would never have achieved the results I did without the advice of a remarkable nutritionist named Joan Buchbinder, who serves as team nutritionist for the Boston Celtics. Joan has no crazy theories, no extreme opinions, no fads. She just offers endless good cheer and simple rules of thumb about nutrition, and then provides easy-to-use resources about smart stuff to eat, the best ways to shop, and, most importantly, what to buy–item-by-item, brand-by-brand, meal-by-meal. In other words, radical change is the result of all sorts of practical steps–not a single burst of charismatic leadership or big-picture vision, but new habits learned and reinforced with simplicity and regularity. That doesn’t mean change has to happen slowly. Quite the opposite. For big change to happen fast, people have to embrace new ways of working or collaborating or eating–but the new behaviors have to be defined clearly. Dean Ornish made this point too in “Change or Die.” He found that “radical, sweeping, comprehensive changes are often easier for people than small, incremental ones. For example, he says that people who make moderate changes in their diets get the worst of both worlds: They feel deprived and hungry because they aren’t eating everything they want, but they aren’t making big enough changes to quickly see an improvement in how they feel.” Yes, Ornish’s program is radical–but it comes in the form of highly detailed recommendations that are easy to execute. 3. Success breeds success. This may be my least surprising conclusion, but it’s the one I experienced time and again. It’s striking how losing a few pounds generates the enthusiasm to keep going and lose a few more pounds. In part that’s because little victories inspire greater confidence, in part it’s because outsiders begin to notice and offer positive feedback, which creates even more commitment to keep going. When it comes to change, big victories are the results of lots of little wins. Here’s hoping your change efforts–personal or professional–don’t run into serious problems. And I hope I haven’t taxed your patience by sharing my personal case study in change.